There comes a time in every investigative procedural when they will decide they need a case that Cuts Too Close. (Sometimes that’s half the point of your entire show and sometimes it’s just to let someone have an acting showcase for a bit, but it’s largely just story sense; TV in general is not really awash in emotionally-uninvested cops.) There also comes a time when, for the sake of a twist, the show slips in a misdirect that, on reflection, gives you diminishing returns. As often happens when Elementary stumbles, the story’s bones are solid; it’s just in small ways the episode starts to lose shape (usually because the shape of a CBS procedural is going to win out). Making Marcus face his past as he feels powerless about the investigation into Chantal’s assault is a great foundation to illuminate his character; pushing someone to their limits for sympathetic reasons is almost always interesting to watch. Why turn Chantal’s (and later Booker’s) case into a maze of corporate blackmail gone awry? Why build up Roy Booker so much this season only to remove him from a narrative in which he’s been so entrenched? There were a lot of threads Elementary could have pulled to put Marcus in a tight spot. Given how things fall out, this episode turns Chantal into a plot device for Marcus to worry about, for whatever time he gets in between twists about a plane broker’s bad divorce, a slick attorney, an investigator getting his roots done, and a country club; why? 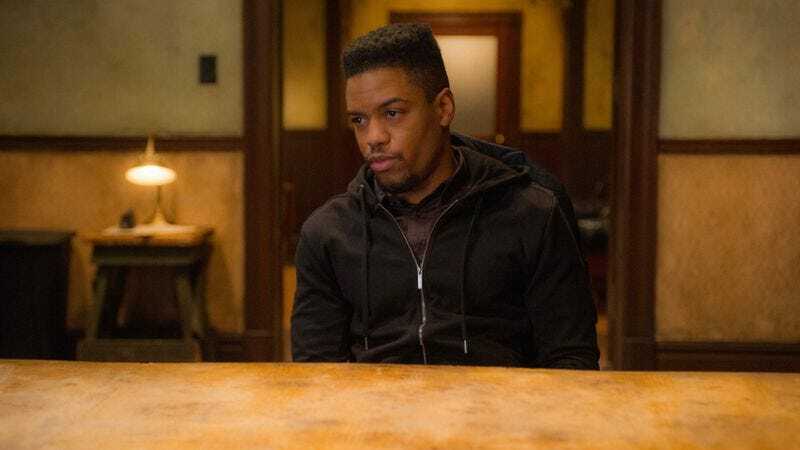 This feels especially like a missed opportunity given how much Jon Michael Hill manages to do with what he has, he could easily have anchored an episode that was more character study than gotcha-whodunit. (His delivery during the first meeting with Ukhov, when he mentions seeing the pictures of Ukhov’s wife after he beat her, perfectly straddles the line between quiet righteousness and an increasing urge to punch every abuser in the face until they’re all dead.) The show has managed to avoid a lot of the pitfalls of having preternaturally-flawless cops thanks in part to Aidan Quinn and Hill consistently delivering two cops so fundamentally good that we’re never worried about them crossing a line. Hill is so good at playing Marcus on the brink that I can only imagine what he’d have done with more time to consider how willing he was to cross the line, and what that would mean for him. As it is, we don’t know, because Sherlock gets involved. He discovers the final twist, of course (hard for Marcus to do from the bench), and his overtures of friendship are kind of perfect. (Jonny Lee Miller carefully repeating “Have you ever eaten ants?” was an episode highlight.) But he also cuts off Marcus’ attempt to come after Ukhov and deduces Marcus’ past, which make him feel oddly custodial. Though Sherlock dryly accuses Marcus of suffering a case of “vengeance interruptus,” that doesn’t make us any less aware that Marcus was robbed of the chance to make a decision that would have been a fairly heavy moment for his character. It would have pitted that fundamental goodness against how far he had sunk into the grip of his old trauma. It would have told us a lot about Marcus—and, perhaps, told us more about his trauma than Sherlock does when he tries to put himself in Marcus’ shoes in that final scene. Elementary is capable of smartly showing a lot about its characters in small moments. But the circumstances of “Fly Into A Rage, Make A Bad Landing” called for big moments; if nothing else, a regular character admitting to a history of abuse and a plan to seek treatment, in a show that stars a recovering addict himself trying to move through trauma and re-engage with the world, sounds like something we should expect to see again. But honestly, it doesn’t feel like we will; it feels as though the vague promise of therapy acts to close the topic rather than introduce a new undercurrent for the character. In an ordinary episode this might not have felt so unsatisfying, but this should not have played out like an ordinary episode—and despite Jon Michael Hill’s great turn, it’s hard to shake the feeling that it did. “But message received. We we all put rubber sheets on our mattresses.” I can only guess why this was an aspect of this case, but it can be very satisfying to see Sherlock so absolutely fed up with a suspect. Also a small moment, but one that leaves me curious: Marcus hesitates before telling the lie that his mother was in a car crash, and Joan has a look on her face like she’s not quite buying it, but when he’s finished, she just pauses a beat and then suggests he get some fresh air. Lucy Liu plays it as if Joan suspects the lie and has chosen to wait until a better moment to ask about it, and we don’t see enough of her in the episode’s character moments for her to ever mention one way or the other. So, just in case anyone is looking, later, for the most effort-to-payoff ratio ever given for a throwaway detection on this show: Sherlock hired an actor to play a man with intense-yet-falsified online credentials (which presumably include employment history and banking records) so he could tour the country club, because this actor looked so much like someone on the Wanted list that if Sherlock showed the FBI pictures of the tour, they would immediately descend and be mad at the country club (and not the man who had made the false accusation, I guess? ), all while in the car on the way over to a country club where he planned to blackmail an employee. I am very curious about whatever veto in the writers’ room denied him the Morland Holmes Name Drop on this one. Those CSI flashbacks are also not great.